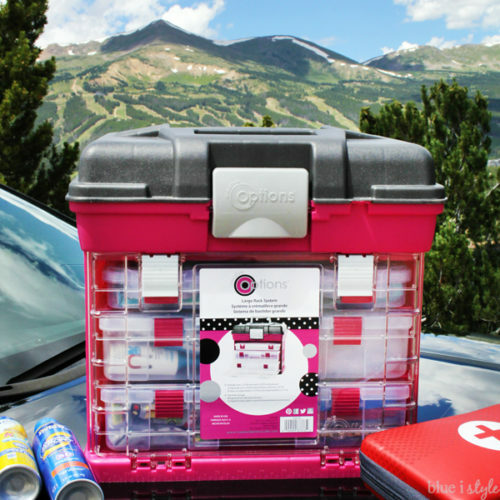 15 Car Organization Hacks You'd love to Try! Home A Better HomeOrganizing How To Organize Your Car Like A Pro? 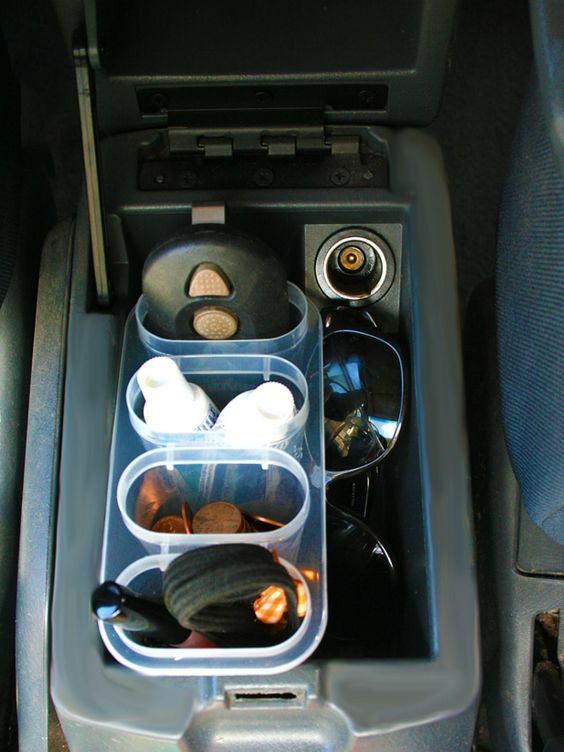 Sometimes keeping your car organized gets much more difficult than paying for its expenses. On top of that, if you have kids traveling in that car, I pity you. But, it is not their fault. Cars can get messed up very easily. If you accidentally spill your favorite drink because of a jerk when traveling, I bet an hour of yours is gone in cleaning that mess up. That was just an example. Avoid eating in your car. Check out our car cleaning tips to clean such mess easily. 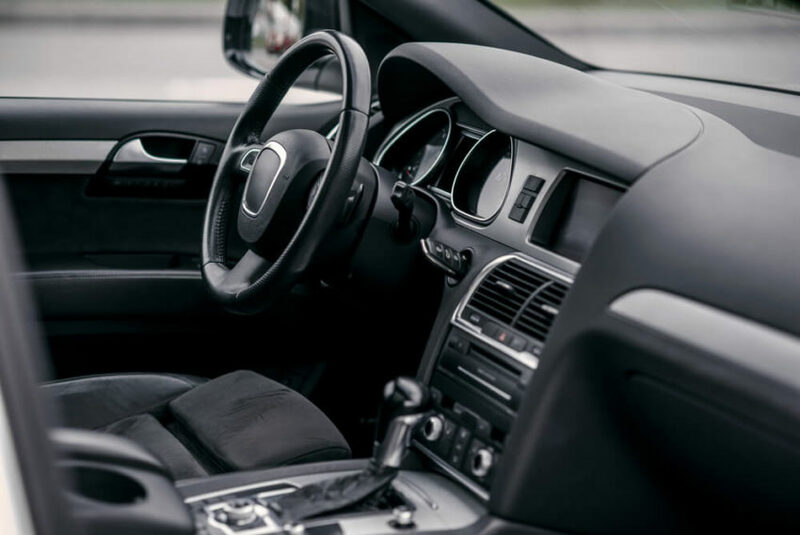 Apart from liquid spillage, there can be a lot of clutter inside the car ranging from anything to anything. As always, I am here with ideas and hacks from around the web to help you keep your car organized the easy way. Okay if you want to carry that glass of your favorite drink or other eatables, don’t kill your desire. Here is the solution. 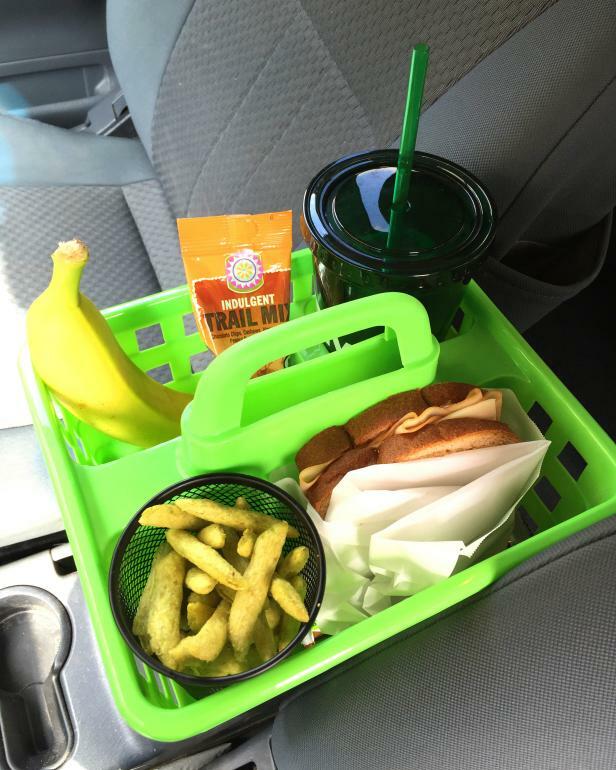 You can make managing the eatables in the car easy for yourself. Use shower caddies to store foodstuffs and reduce the chances of littering your car. 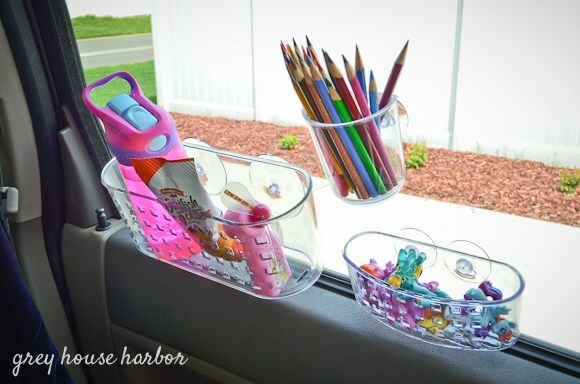 You can use these sink caddies installed on the car windows to store all kinds of supplies when you are on a trip. If your kids are traveling with you, its best to use it for storing their toys and other stuff which they require frequently. This will save you from their constant cries asking for a particular toy again and again. They will simply take it from these installed units which otherwise would have been kept by you in some bag. Yes, a popsicle mold which is very cheap can help you organize your car’s center console. Look at the picture. Doesn’t it look like something that has been made to organize that place? Use it to keep some loose items such as change for the toll, USB, etc. A popsicle mold will keep all your stuff categorized instead of mixing it up and making it look untidy. 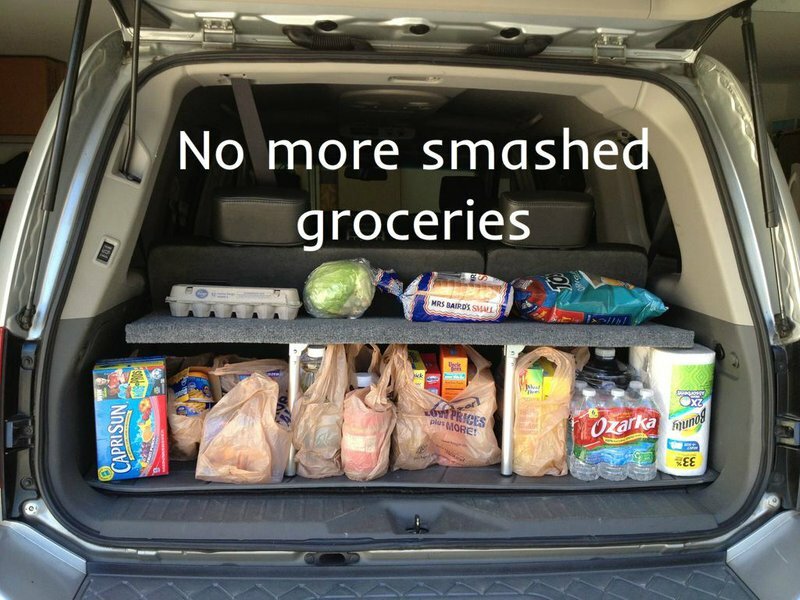 If you use your car when going for grocery shopping, then this is a must know a hack for you. Buying a good amount of groceries usually result in shopping bags smashed and cluttered on top of each other in the trunk. This is really a messed up situation. 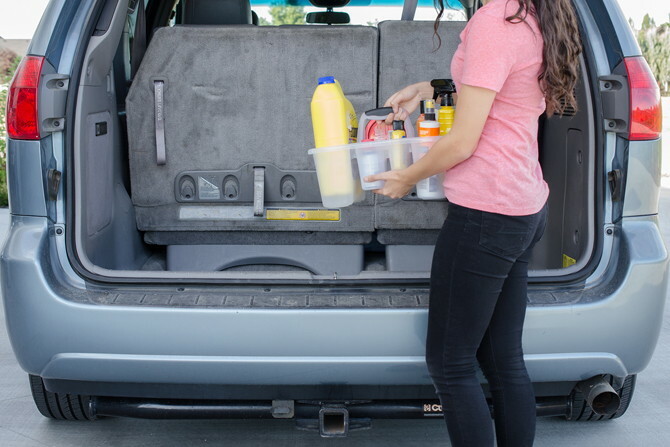 To arrange the groceries properly and get a neater trunk, this pop-up trunk shelf is the perfect solution. You need open wire closet shelf, grey auto grade carpets, zip ties, and teacup hooks. Refer to the guide to assemble it. Traveling can easily become boring, so it is obvious to carry an IPad, tablet or some other device for entertainment. But holding the tablet in hand throughout the journey is troublesome right? 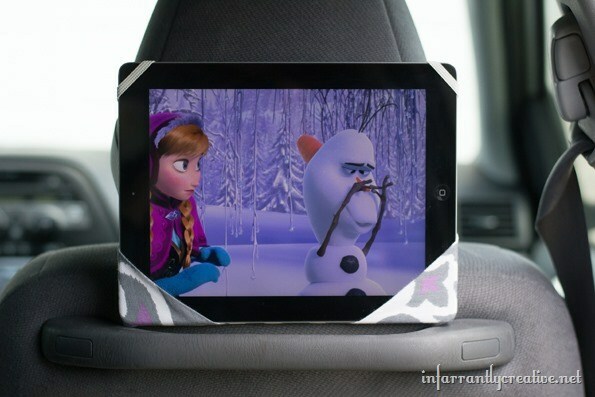 This easy DIY Ipad holder which only requires some cutting, sticking and sewing can save you from that pain. So next time when you travel you have this device holder attached to the headrest for hanging your tablet and keeping yourself comfortable. 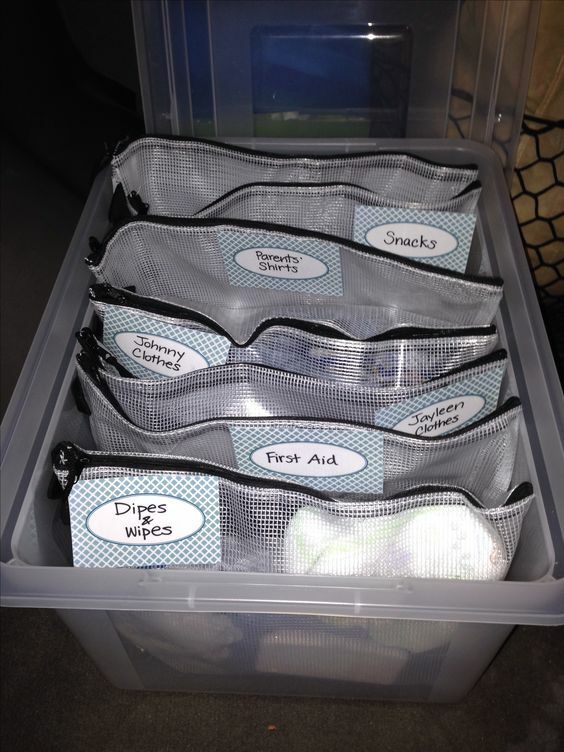 Look how perfectly Blue I Style Blog makes an organized family car kit. She has perfectly kept in mind the major requirements for family travel and made this family car kit. It is so convenient to find all those requirements at one single place. 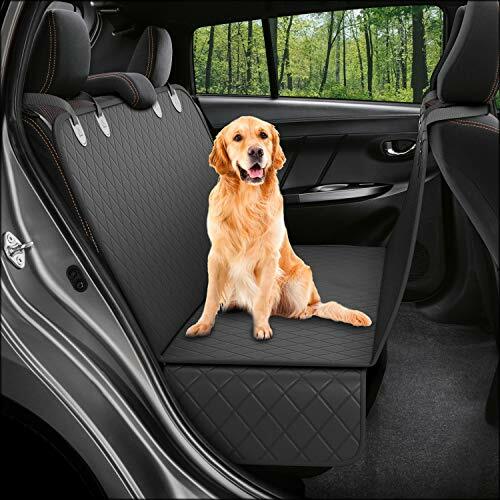 If your dog travels in your car, then protect your seat from scratches, and spills using a dog seat cover. Your dog might be well mannered, but it may damage the seats unintentionally which is a bit pricey. So isn’t it better to be safe than sorry? Convert a cereal dispenser into a trash can for your car. 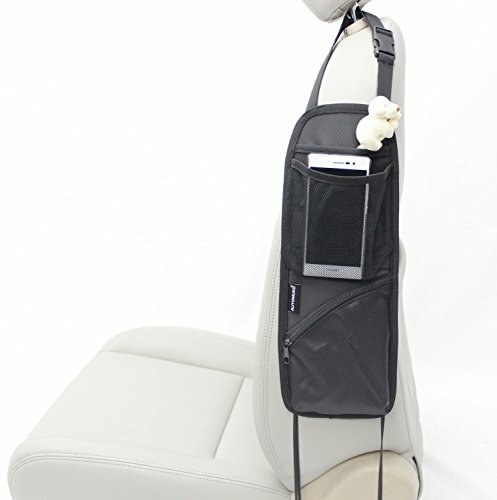 It is small, convenient to use and just perfect for your car. 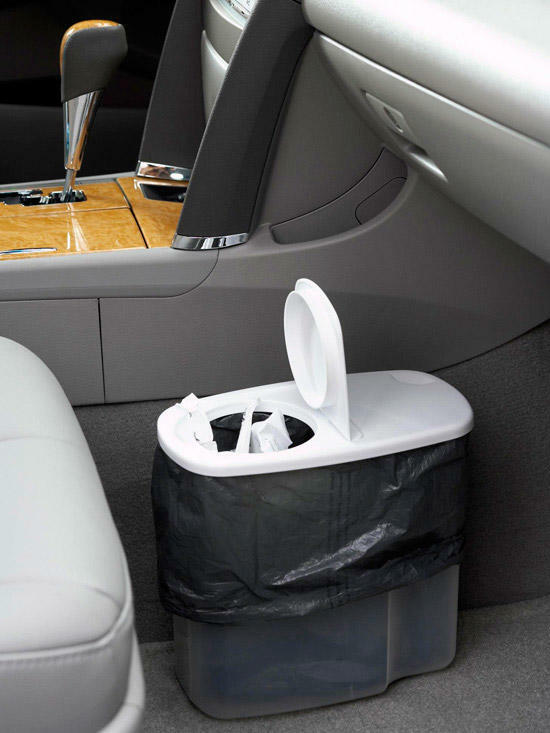 A trash can in the car can highly prevent you from littering your car with the chocolate wrappers, pieces of paper and all other things. Keep such zipper bags of different categories such as snacks, first aid, games, etc as per your requirement always prepared. So whenever you are in a hurry to leave, just grab the ones that you require. 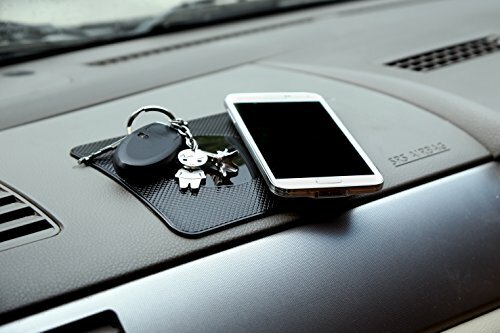 These cool anti-slip mats will hold your necessities such as mobile phone in place. Why let the space on the sides of the seat go waste? This side seat organizer can be used for storing essentials. It’s not at all a good idea to make the floor mats of your car dirty with the muddy shoes as it will just increase the trouble for you. You will have to clean all those muddy mats which I think is not a task that you will want to do. To save those car mats from getting dirty, always keep some shower caps in your car to store your dirty shoes until they are cleaned. This is another amazing car organization hack to organize the oils and fluids required for your car’s upkeep using a shower caddy. Whenever you need them, you will have all the necessary oils and pieces of equipment required in one place. Isn’t it too disgusting to hear the sound of stuff in the grocery bags scattering around on any jerk to the car while returning home? Well, I have an easy solution to this problem via Australian Handyman Magazine. 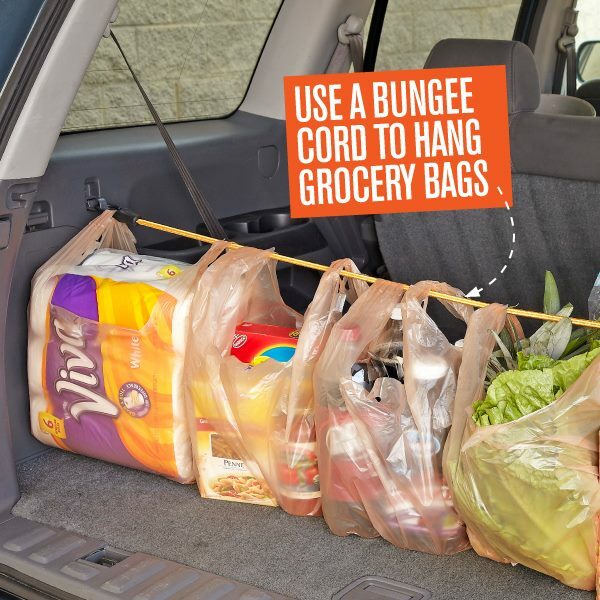 Make space for a bungee cord in your car and whenever you need to save anything from rolling out of the bags, stretch across the bungee cord and hang the bags from it. It will look as if someone is holding those bags just like you do with your hands and save the delicates inside it from destruction. 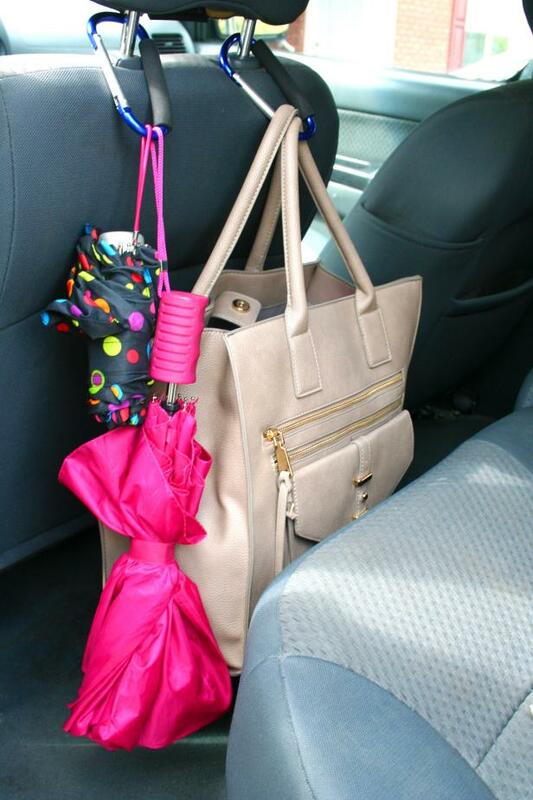 Don’t keep your purse and umbrellas on the seats so as to end up shifting them here and there as per your convenience. Provide them a fixed place, so that you don’t bother each other. And nothing is better than hanging them using the carabineer clips which doesn’t use any ground space. Simply restrict them to the back of the seats using these clips. These car organization hacks will help you to keep your car organized quickly. Combine different hacks together for a better organization. If you found these hacks useful, then do share it!